Most DAR volunteer work is accomplished through a committee system led by committee chairs. The variety of committees available to members allows them to pursue their own interests and passions while promoting patriotism, supporting education, preserving our American history and enjoying opportunities for friendship and collaboration. Many of us volunteer our time by participating in national veterans and historical events, supporting patriotic projects in schools, and entering data for our National Society. Other avenues that contribute to the objectives of DAR are patriotism, education and historic preservation. In addition, our chapter financially contributes to the support of DAR schools and several Native American schools. Below are some of our chapter's annual service opportunities. 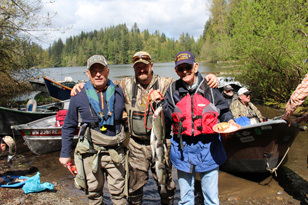 Fish Out - We co-host an annual fishing opportunity for veterans participating in the Project Healing Waters Fly Fishing program, a non profit organization dedicated to the physical and emotional rehabilitation of disabled veterans through fly fishing. Veteran's Day - We honor veterans living at a local retirement community with recognition and a celebratory party. JROTC - We present a medal to an outstanding high school student participating in the Junior Reserve Officer Training Corps. Memorial Day - We partner with other local organizations such as the American Legion in providing an opportunity for community engagement in observing and honoring those who have died in military service. Active Duty Military - We collect coupons that are sent overseas to active service military and collect care package items for the USO and other military service organizations. Book Donations - We support local schools and nonprofits with donations of new and gently used books of all sorts, depending on the specific projects. Box Tops for Education - We collect box tops to benefit schools. 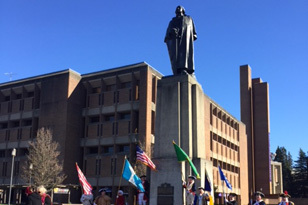 Presidents Day - We participate in the ceremony and wreath laying at the George Washington Memorial at the University of Washington. Records preservation - We participate in a wide variety of projects that are crucial to saving our history for future generations. America 250! : Planning for the upcoming 250th Birthday of the United States in 2026 including observation of related anniversaries. American Heritage: Promotes the preservation of American heritage in the fields of arts, crafts, drama, and literature. Member Contests are available in all fields. American History: Promotes American History Essay contests in schools and recognizes outstanding teachers of American History. American Indians: Encourages awareness of issues within the American Indian community and provides financial assistance and educational aid to Native American youth through Bacone College, Chemawa School, Summer Camp, and SIP Fund. Americanism: Encourages members to participate in naturalization ceremonies and assist with citizenship classes. The DAR Americanism Medal and DAR Medal of Honor are available. Children of the American Revolution (C.A.R. ): Promotes the work and principles of the C.A.R. Commemorative Events: Coordinates celebration of NSDAR observances that support historical, educational, and patriotic objectives. Community Classroom: Encourages Chapters to adopt a classroom or school to provide volunteer and financial assistance. Community Service Award: Recognizes worthy residents in the local community for outstanding achievement in cultural, educational, humanitarian, patriotic, and citizenship endeavors. Conservation: Promotes wise use, repair, and restoration of our earth's resources. Conservation Medal Award applies to conservation achievements in this field. Constitution Week: Brings the U.S. Constitution and the importance of its preservation to the attention of the general public. DAR Genealogy Preservation: Preserves the various printed records of the National Society by entering the information into searchable databases. DAR Good Citizens: Works with local high schools to recognize and reward high school seniors who possess and exhibit "Good Citizen" qualities. DAR Magazine: Shares information about DAR's award winning magazine, The American Spirit, which shares stories covering history, genealogy, patriotism, and education. DAR School: Local chapters support DAR Schools by donating box tops, material supplies, and monetary gifts to help support the students. Members may also recognize students on holidays and other special days, such as birthdays. Visits to DAR schools are always welcome. DAR Service for Veterans: Volunteers at local hospitals assist with VA activities. Local chapters supply comfort items, reading materials, monetary support, and other material items as requested. VAVS (Veteran Affairs Voluntary Service) Daughter, Youth Volunteer, and Veteran Patient Awards for service are available. Flag of the USA: Promotes a strong patriotic feeling and respect for the American flag. Genealogical Records: Collects unpublished records of a genealogical nature and prepares them for submission to the DAR Library. Historic Preservation: Promotes historic preservation. Historic Preservation Medal and Historic Preservation Awards are available for individuals and organizations in the community as well as opportunities to participate in Chapter Contests. Junior American Citizenship (JAC): JAC teaches children grades K - 12 about our government and citizenship through participation in various contests. Junior Membership: Promotes juniors (DAR members ages 18-36) to become active members of NSDAR. Outstanding Junior Member Contest is held yearly. Lineage Research: Helps prospective members research and obtain documentation for their DAR application. 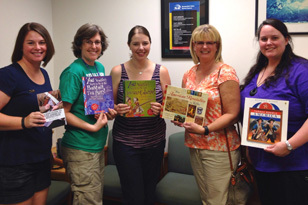 Literacy Promotion: Promotes literacy in both children and adults. Membership: Promotes membership in DAR. Volunteer serves as liaison between NSDAR and members. National Defense: Collects and presents articles of interest regarding national defense. Recognizes patriotic students, elementary through high school, and ROTC Cadets. President General's Project: Promotes support of the current President General's Project by encouraging members to purchase the President General's pin and make monetary contributions to the President General's project fund. Project Patriot: Supports America's service personnel involved in current conflicts abroad. Public Relations: Assists with informing the public about DAR objectives and activities. DAR Scholarships: DAR sponsors various scholarship awards to students for higher education. Volunteer Information Specialists (VIS): Daughters use their computer skills to benefit the Society at the local, state, and national level. Volunteer Genealogists: Volunteer "Genies" are NSDAR-trained and assist with the completion of well-documented applications and assist with verification of supplemental information. Field Genealogists conduct workshops for both members and prospective members. Women's Issues: Heightens awareness of the complexity of issues facing today's women.